indigenous women gathering in New York. The women gathered together with a common goal and team spirit enjoying the discussion of the past event and brought some important agendas for upcoming events. 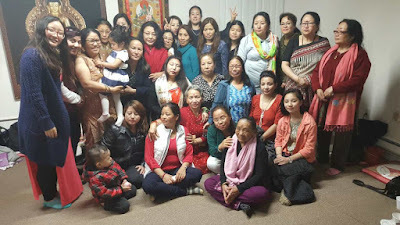 They discussed and evaluated the International Women’s day on which FIWNA had organized an interaction and also joined with NRNNCC USA in the grand event. Everyone brought some important topics also identified some weakness and how other organizations biased our organization due to being the indigenous women’s organization here. It concluded to strengthen to its discussion and put all the aspects to the concerned party in the future and also will enhance its capacity to enhance and organize the grand program. On the same occasion, FIWNA executive with the presence of its advisors and other members decided to organize its annual picnic program on coming June 3rd of 2017. Moreover, it will be organized blood donation and other women’s empowerment program in the near future. The decision was made consciously taking the consideration and discussion within all the attendees and making the feeling of we, and we can do it and we will make it something difference. The gathering presented the great extent of team spirit and showed that team which carried a great value and significance in all aspects of life. Potluck had been served with delicious items and enjoyed everyone at that moment, having a set of discussions relating how we could be strong and how we could help each other. It is always wise to grow and develop we feeling in the organization which bring the best result and accomplishment in the future.